The ferry departs from the 4.5 mile long Homer Spit, which is the terminal moraine of a massive glacier that filled Kachemak Bay some 15,000 years ago, and crosses Kachemak Bay is an enormous and productive embayment that is largely protected from development. A clear day's view from the inlet includes three volcanoes: Augustine, Iliamna and Redoubt, all of which have erupted since 1989. The most recent to erupt was Augustine, in January 2006. Near the mouth of Kachemak Bay, the ferry passes by Sadie Cove, Tutka Bay and the small town of Seldovia before rounding the southern end of the Kenai Peninsula to leave Cook Inlet. Throughout the bay, watch for sea otters, porpoise, whales and harbor seals. According to federal surveys from 2003 through 2005, the number of harbor seals in Cook Inlet peaks in June and August, when seals are birthing, and is lowest in October and April. About 60 miles out of Homer, the ferry passes to the east of the Barren Islands, a group of mountainous islands housing a significant Gulf of Alaska seabird colony, home to nearly half a million seabirds. The ferry passes closest to the high, rocky peaks of East Amatuli Island, an oasis for the 18 different species that benefit from its strategic location, away from most predators and close to abundant forage fish. The cone-shaped Puffin Peak is the highest point in the eastern Barrens. Along the Aleutian route, the Barren Islands mark the ferry's first passage through part of the far-flung Alaska Maritime National Wildlife Refuge. Refuge biologists monitor bird populations here annually, as funding allows. They've also studied colonies of common murres, black-legged kittiwakes and tufted puffins since 1995 as part of research into effects of the 1989 Exxon Valdez Oil Spill. The colonies at the Barren Islands represent the largest seabird colonies in the path of that spill. The Barren Islands are home to fork-tailed storm-petrels, tufted and horned puffins, parakeet and rhinoceros auklets, ancient murrelets, marbled murrelets, Kittlitz's murrelets, murres and black-legged kittiwakes. 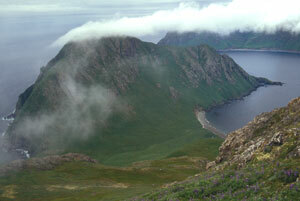 The areas around the Barren Islands support high fish populations and are a summer feeding ground for humpback whales. If you are fortunate enough to pass by the Barrens in the daytime, look for the rhinoceros auklet, which is not common along this route. Tens of thousands of jaegers and short-tailed shearwaters fly here during Alaska summers from their Australian nesting grounds. Savannah sparrows fledge here in July. 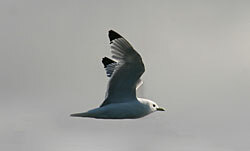 Other species of birds along the route include northern fulmars and Aleutian terns. The southernmost Barren Island, Sugarloaf Island, is one of the Gulf of Alaska's most important Steller sea lion rookeries. Just north of Kodiak, the Tustumena may stop briefly at Port Wakefield/Port Lions, one of six Native communities in the Kodiak Island Borough. Port Lions, a city that in 2001 had about 250 people, was established following the partial destruction of Afognak Village, on Afognak Island, by a tsunami caused by the great Alaskan earthquake of 1964. See the Kodiak page for viewing opportunities on Kodiak Island.